Whether it happens on the first or last day of October, the 2018 Dodger season will end in a matter of weeks, and the legendary Clayton Kershaw, if healthy, will likely exercise his option to tear up his current contract and seek a new one. It’s not that the $65 million Kershaw is promised from 2019-2020 isn’t a lovely sum. But at this moment, Kershaw is better positioned to go for his next big contract this winter, rather than taking the chance of having a better profile two years down the road. It’s been six months since I last brought up this topic, and my opinion hasn’t changed. While other teams might engage in serious talks with Kershaw as a free agent, I still think the odds strongly favor him returning to Chavez Ravine on a new or extended deal. I explained why in great detail in the previous post, but to boil things down to a single thought: There is no franchise for whom Kershaw means more than the Los Angeles Dodgers, and it makes sense that their contract offer will reflect that. It’s that point I wish to expand upon here. Understandably, there will be no shortage of opinion out there that the Dodgers would be better off allocating their future resources somewhere besides Kershaw’s wallet. Sentiment be damned, the 30-year-old lefty is no longer at his peak, and the forthcoming decline could be anything from disheartening to downright ugly. That’s before considering that, although he has already missed parts of four of the past five seasons with injuries, Kershaw hasn’t had the single knockout blow that has sidelined him for an entire year. How long can he keep dodging that freight train? I hear that. And I want to state, for everyone to see, that I don’t care. Look, I know every Dodger fan is tired of being left bereft of a World Series title. Depending on your age, you’ve gone either 30 years of your life or forever without one. It goes without saying that there is no goal more paramount than October glory. But I do think there is something that is just as valuable, or quite nearly just, that’s right under our noses, that we’re in peril of taking it for granted. And that’s having one of the greatest players in the history of the game to call your very own, to share with no one, to sustain you through the dark times and to cherish for the rest of your lives — and to be on that journey from start to finish. Take the Cubs, whose World Series drought from 1909-2015 makes the current Dodger dilemma look like toddlers’ play. About 45 years into their walkabout, the Cubs watched Ernie Banks begin one of the great baseball careers in history. He won back-to-back MVP awards in 1958-59, and racked up his third straight season of at least 40 homers in 1960. Thanks to his accomplishments on the field as well as the sheer force of his joyful personality, Banks was nicknamed, pure and simple, Mr. Cub. In that time, Chicago not only didn’t play in the postseason, they never once had a winning season. Now, this was an era in which players didn’t have the leverage of free agency. Moreover, Banks wasn’t a pitcher, and the only serious worry he had about his future was making a move from shortstop to first base in the 1960s. Nevertheless, the Cubs could have easily surmised that they weren’t close to winning the World Series with Banks in his 20s, and they probably wouldn’t get that much closer in his 30s. If they had traded him at his peak, maybe they could have gotten a package that would given them a big leap forward. … except for one thing. They had Ernie Banks. They had their franchise player. Year after year, they racked up memories and deepened their connection with their guy. They lived in wedded bliss, and nothing, not even death, could do them part. With that, let us return to the West Coast and the present. In significant ways, it’s different for Clayton Kershaw. As I acknowledged before, we’re looking at a pitcher in 2019, not a position player in 1959. Kershaw is dimensionally more expensive to retain, and dimensionally riskier on top of that. 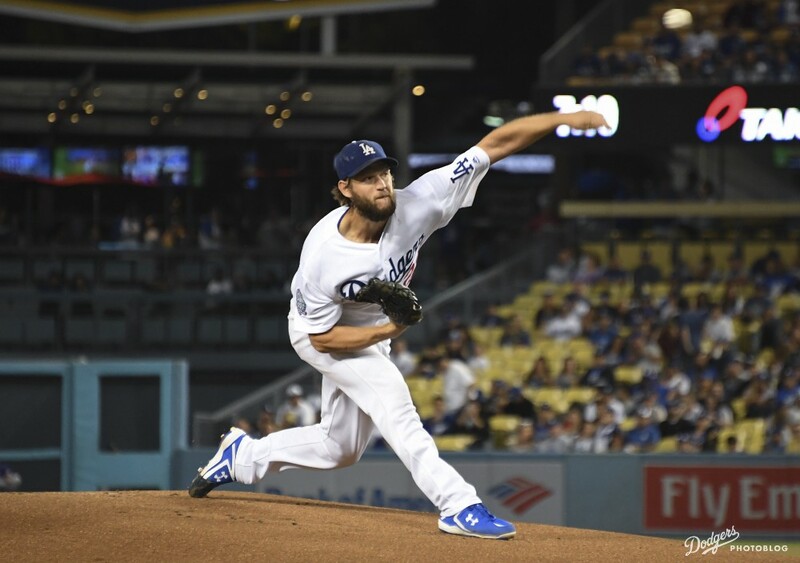 He has also pitched long enough with the Dodgers at such a dominant level that (unlike Mike Piazza, for example) there is already no realistic scenario in which Kershaw won’t end another long drought, becoming the first Hall of Famer inducted with a Dodger cap on his plaque since Don Sutton in 1998. He has already made his mark and then some. We have spent 12 years and three months with Clayton Kershaw in the Dodger organization, and the ride has been just a hair short of perfection. The only blemish is the postseason, a burden which continues to rest disproportionately on his shoulders (come October, if the Dodgers make the playoffs, I’ll remind you why) but that he bears with forthrightness and grace. Regardless, from the day he was drafted in June 2006 with such promise after the worst Dodger season in a generation, to the day he unleashed Public Enemy No. 1 in front of Vin Scully, to his development as the preeminent pitcher of this century — Clayton Kershaw has obviously been the best thing to happen to this franchise since 1988. Of course, I wish the Dodgers had already won the World Series with Kershaw, and it may well haunt me for the rest of my life how close they came in 2017 to doing so. But if given a choice, I would not trade the pleasure of the past 13 professional seasons of Clayton Kershaw for a World Series title that came with no one like him. I wouldn’t do it. For so long now, I hug my delight in this brilliant pitcher so close to my blue-bleeding heart, that as badly as I want to celebrate at the end of a postseason, I treasure what Kershaw has given us at least as intensely. It isn’t the same sensation of Orel Hershiser (or Steve Howe, for that matter) in triumphal pose after the final out of the Fall Classic, but it is every bit as meaningful to me, in much the same way that having Vin Scully describing the action of my favorite team will always be more important than any championship. Kershaw might not ever match Sandy Koufax in World Series wins, but he is every bit as important to the franchise today as Koufax was half a century ago. For Kershaw to leave the Dodgers now would only diminish that, and I find that seriously unsettling. Perhaps, despite a bumpier ride in 2018, the Dodgers will surprise us all, as they did 30 years ago, and win a World Series that at one point seemed out of reach. However, if they don’t, I’m not ready to get off this ride. I’ve booked lifetime passage on the good ship Clayton Kershaw, reserving a cabin with a view on the Dodger deck, and I will sail as far as it will take me.